The recipe is probably of ancient origin since the Romans made a cake called mustaceum for two benefits: it was a digestive aid and a flavourful dessert often served after heavy meals, including wedding feasts. 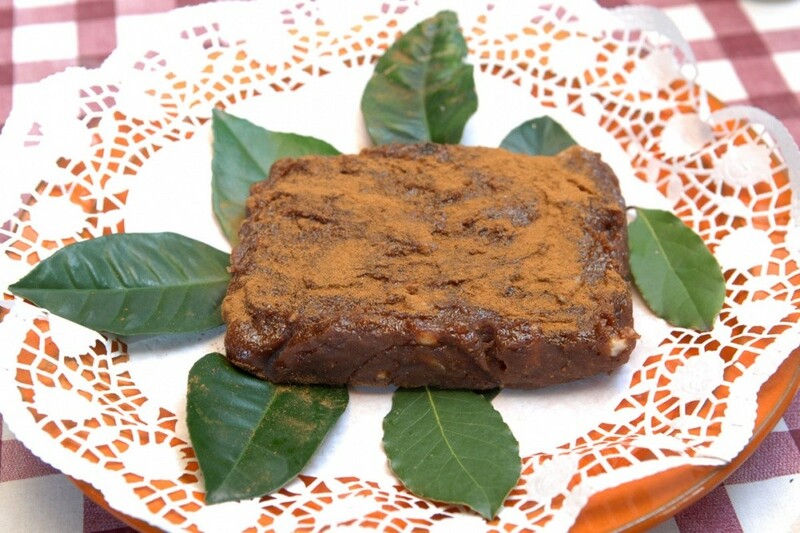 Traditionally and predominantly from Dubrovnik region, from Konavle to Primorje and Pelješac, mantala is a firm, sticky, sweet, dark brown hard paste made of grape must mixed with orange peels, coarse wheat flour, cloves, cinnamon, almonds and walnuts and boiled until thick. It used to be stored in mulberry tree drawers that would slowly extract the moisture so that the cake was never too dry. This grape Must Cake has been prepared for more than 300 years and is a favourite, especially popular when served in squares or blocks decorated with bay leaves. There are also some secret ingredients that make the must cake but let them remain a secret. Boil must until there is 1/3 of the liquid left. Add flour, almonds and spices. Mix carefully and cook for another 15 minutes. Put dump gauze in the mulberry tree drawer and fill it with thick mass. Sprinkle with cinnamon. Leave until cold. Cut into squares or blocks and put on bay and bitter orange leaves and cover to store.